A re-write of my E1 impressions is available as a PDF-file on my Kongsfjord page, and on the link section to the right. One more QSL the past few days, KLGN Logan UT 1390. Most welcome. KVNU was a 2005 log, while the two latter were heard recently. Still waiting for KDAL Duluth MN 610 and WMT Cedar Rapids IA 600, both heard last week. The E1's display is very large and has room for all the information you need, including a large frequency readout. The illumination has three positions; off, dim and bright, and the contrast can be adjusted. Unfortunately, the "bright" position is nowhere as bright as I would want it, accustumed as I am with the IC-746Pro's exceptional display. May be difficult to read in dim light, or if the lightsource is behind the radio. Tuning is done by way of a tuning knob, up/down buttons, and direct input via keypad. The tuning knob could use a dimple to make quick tuning easier. Otherwise, one can choose to tune in 10, 100 or 1000 Hz increments. The up/down buttons are used for tuning in pre-selected tuning steps; 5 kHz on Shortwave and Longwave, and selectable 9/10 kHz on Mediumwave. The functions are easy to learn and easy to use. According to the specifications, frequency stability is +/- 10 ppm in the 0-50C temperature range. Not impressing. Actually it is advisable to let it warm up for an hour before doing much ECSS DX. Modes and bandwidth are chosen from a row with "soft buttons". One button defines the bandwidths as you cycle through the alternatives. One button defines AM/AM-sync, and one SSB button defines USB or LSB. If AM-S is selected, the SSB button defines USB, LSB or DSB (double sideband). There is no choice for modes like CW and RTTY. The button for PBT turns it on and off, and a separate control under the tuning knob adjusts the offset. The offset is displayed above the soft button. These functions are rather intuitive and easy to use. Audio: Volume, Treble, Bass and Squelch controls are placed on the left side. The Treble and Bass controls do not have a very wide span, although they appear to be adequate for adjusting the audio blend to one's personel preference. I was not impressed though. Time, Memory: The E1 has rather advanced clock and timer functions which I will not delve further into now. One clock is displayed, unfortunately only hh:mm, not seconds. The E1 also has ample space for memory channels; 500 free to use and 1200 restricted to 120 countries. The memory channels are easy to store, edit and delete. They store frequency, mode, bandwidth, AGC setting, PBT setting and Sync detector setting. External Antenna input is placed on the left side, with separate sliders for AM and FM to choose between internal and external antennas. The E1 does not have an inboard ferrite antenna, which has caused outcry among some users. Instead the whip is supposed to be used for MW reception as well as SW reception. Many have also commented the lack of a carrying handle. No problem for me, and the rubberised surface which I have criticised earlier actually makes it very safe to hold. The 77-page manual is for the most part well made. It also contains a quite detailed specification list, and a block diagram. The appendix has an entry-level introduction to SW listening which could have been better, and obviously not made with the E1 in mind so maybe they borrowed the text from somewhere else. Conclusion: The Eton E1 is a portable with the ambition to perform equal to a high quality desktop. With a few exceptions it really does act like a desktop but while getting there it has lost some of the characteristics of a portable. Nevertheless, the Eton E1 is an excellent receiver of its own right and will perform admirably in most challenging DX situations. And the price simply cannot be beat. Very quiet conditions on the sun this weekend, at least until Sunday morning when the high speed stream from coronal hole CH239 killed the opening. I chose not to focus much on Asia this weekend since I had antenna and feedline repair works and needed to do them while it was light. Only modest signals from Australia on x-band so probably nothing spectacular. Good table-top receivers have a suite of tools available for fighting off interference. Besides bandwidth choices, ECSS reception and passband tuning, the user can choose to employ automatic or manual notch filters at the audio or IF level, noise blankers and noise reduction functions. We need any function that can enhance the signal-to-noise level of the desired station, and often if one tool doesn't work, another might. Portable receivers usually lack many (or all) of the interfering fighting tools. Alas, that is the case with the E1 as well. As stated earlier, its ECSS tuning is very good, but ECSS must be regarded as a rather compulsary part of an HF receiver today. AM Synchronous Detection is quite good overall, but not suited for DX-ing narrow splits. So, what do we have? According to Eton's specs, there are three bandwidth choices; 2.3 (sometimes referred to as 2.5), 4.0 and 7.0 kHz. The 2.3 is apparently the muRata CFJ455K5 which is mounted in a large number of receivers. I don't know the origin of the other filters. Judging from audio recovery, I'd say the 4.0 is more like 4.5, and the 7 is more 8-ish. I hope someone will take the time to measure the correct bandwidths and the shape factor. They appear to have good ultimate selectivity though. There's nothing wrong with the filters except my personal preference would probably be less than 4, and 6 kHz for the two wider filters. Other people with other preferences will surely disagree. Actually, a portable with a choice of three mode-independent, good quality IF filters must ble close to one of a kind. Something we cannot do without! In SSB (and ECSS of course) , PBT allows for moving the IF passband of the receiver relative to the detector BFO (mostly quoted from the manual). The PBT can be tuned +/- 2 kHz. For reasons mentioned below, the PBT is in more use on the E1 than on my other receivers. The manual is rather inconclusive about the PBT and AM. On page 24 it says "PBT also functions in AM and AM SYNC modes, but in these modes it act primarily as a frequency offset, which can also be accomplished with the 'TUNING' knob". If we're to believe this the PBT control in AM is identical in function to the Tuning knob! However on page 15 it says "The PBT (...) knob varies the IF passband of the receiver plus or minus 2 kHz (...) relative to the displayed frequency when on AM Mode". When I use the PBT in AM and compare it with off-tuning using the Tuning knob, the audible results are identical. So, is the AM PBT an IF shift, or is it off-tuning? A Notch Filter is an essential tool for removing heterodynes. Any notch filter will do really, even a basic audio notch filter - but the E1 has none. That is in fact a major drawback with the radio. Removing or reducing hets can to some extent be done by using the PBT, but that is 1) time consuming and 2) can result in increased interference from a different source. A Noise Blanker is also missing. Ignition-type noise, and in my case Loran C ticking, can be reduced with a good noise blanker. And there is no Noise Reduction function. Although we have seen many of questionable quality, and that they often degrade the audio quality, in some instances they really do help. Obviously, here's where the tabletop and the portable go separate ways. With a sensitivity at the 0.5uV level, the E1 needs to have a good front-end, especially when connected to large outdoor antennas. According to the block diagram in the user manual, the radio incorporates bandpass filters at 1, 2, 4, 8, 16 and 3o MHz. The preamp (or "DX" setting) is 10dB according to the block diagram. According to specifications, IP3 at 5 kHz spacing, preamp on, isn't really out of this world: -30dBm. It should work well in a "normal" RF environment (can somebody please tell me what a "normal" RF environment is?). What about mine? My RF environment is surely not normal. It consist mainly of a Loran C transmitter on 100 kHz, 14 km away as the crow flies, and the output is 250kW. I also have an NDB, BV on 399 kHz, 16 km in the same direction. My North American beverages point more or less directly towards them. I have an array of five beverages, at present connected to an antenna selector, via a switchable 10-13dB push-pull Norton preamp, into an amplified 1:8 splitter where the preamp is identical to the first but has a net gain of 5 dB. It is also switchable. Normally I use the splitter preamp all the time, and turn on the other preamp when signal levels drop after sunrise or before sunset. I use the receivers' preamps as I find necessary. But after sunrise, they are indeed needed. So what's the E1 front-end like? The Loran C should be a good indicator if the receiver is prone to overload. When both external preamps are engaged, there is a bit more Loran C noise below 1 MHz than I find on the other receivers. Nothing dramatic though. However, if I engage the "DX" setting, the Loran C will take over the AGC completely and mute the receiver. But - only below 1 MHz. The front end filters are doing their job. If I disengage one of them (no matter which), the overload disappears. I also did a test on the 49-meter band at late evening when signal levels are very high. I used an amplified ALA100 8x4m loop, If I engaged all preamps, there was severe intermod. If I disengaged one of them (no matter which) the intermod disappeared. Mind you that none of the other receivers behaved the way the E1 did. Conclusion: The Eton E1 is not bullet-proof. Use the internal preamp only when it is really necessary, especially if you have a very strong RF source within the passpand. I feel rather lucky that Eton chose to put the first bandpass filter at 1 MHz and not at 1.8 or 2. That would have limited the E1's capability as a MW DX receiver. However, with the preamp disengaged MW sensitivity will still be close to 1uV. A little disappointment this, but it doesn't really spoil my impression of the E1. I keep comparing it to receivers/transceivers costing at least three times as much and it is doing remarkably well so far. In addition to the usual modes AM and SSB (which can be used for ECSS), the E1 is equipped with a selectable-sideband AM synchronous detector (AMSD). The ECSS technique is supposedly well-known among DX-ers so I will not go into that subject here except note that the E1's ECSS reception is very good, once the frequency alignment has been done. So what does AMSD do? Some say that AMSD is the life and soul of a receiver - hinting perhaps that a non-AMSD receiver is no good. Baloney. For further enlightenment on the possible virtues of AMSD, please read Dallas Lankford's articles on the subject. AMSD is often associated with reducing distortion caused by selective fading. This is true, but you don't really need an AMSD for that, you can use an Elliptic Low Pass Audio Filter (ELPAF) instead. Selectable-sideband AMSD can also be used for reducing interference from one side much the same way as with ECSS. AMSD has one downside compared to ordinary AM: It is usually non-transparent; it needs to lock onto a signal. This takes time, and is often accompanied with growling when the radio tries to center on the passband. Some AMSDs loose lock fast, some stay put. 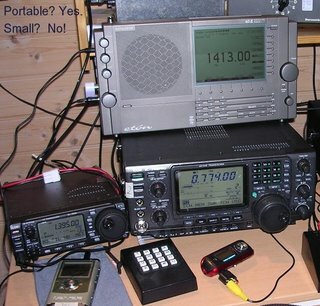 The E1's AMSD has three positions; USB, LSB and DSB (double sideband). I tested its distortion-reducing capabilities on some fading SW frequencies. Reducing distortion will normally be best when using the sidebands, but I found that the AMSD was very effective even in DSB. On MW there wasn't much difference on the signals I tested, but if I had tested with groundwave/skywave blends I believe I might have had the same results as on SW. Comparisons were made with the AM Slow AGC setting. The conclusion is that if I want to listen to a SW broadcast I would probably use AMSD. And locking to a signal is rather straightforward. It does so within half a second, without muting the receiver's audio (any AR7030 owners out there? ), and without growling (any SE-3 owners out there?). Or mostly without growling. If the carrier is far away from the radio's frequency it needs to tune in and does so much more slowly than the SE-3, and it growls a lot. But what about split-channel DX and interfering stations with very high signal levels? Well there's a mixed bag. I tested this specifically on 1250 (Ontario) with a strong European on 1251. And now we're at the core of the problem. The manual says that the AMSD will lock on the strongest signal in the passband. So even if you choose LSB, adjust the PBT to get away from 1251, and even if you manage to lock on 1250 - if 1251 increases its signal level it will simply take over the lock and you will find yourself listening to 1251 instead of 1250! The problem will of course diminish the further you are away from the offending signal. But there is in fact a problem here. Imagine this happening at 10 seconds before the full hour. I cannot recommend the use of selectable-sideband AMSD for serious DX unless you are certain that the lock won't be lost and "transferred" as it were, to the interfering station. This is especially true if you operate several receivers and need to let the E1 record audio unattended. On the other hand, if you meet that requirement, the audio quality from the selectable-sideband AMSD is very good. ECSS audio quality is good, better than expected. There are slight tonal differences between USB and LSB but they are not disturbing in any way. But the difference should have been avoided. Conditions towards DU was bordering on excellent Wednesday evening when in-band east-coast Australians were heard with surprising strength. 4QD Emerald-1558 the best I've ever heard them, and 2BL Sydney-702 well readable at times. Excellent strength towards Japan and Korea for more than an hour. The Papuan NDB's on x-band were relogged. The night brought good signals from North America, mostly inland with dominants from Iowa; later a spot opening brought enhanced signals from Minnesota. The Eton E1 had its first night in real interference. It did in fact fare well! I tested both the AMSD-Selectable Sideband and ECSS techniques to fight off interference, and I am preparing a post on just that. Audio quality and recovery is very good and very pleasant and I was surprised to hear the spacious audio in SSB mode. Most receivers produce very "flat" SSB audio. AM audio quality: The AMSD reduces distortion in rapidly fading signals, in all three settings. Otherwise there is no significant difference between AM and AMSD audio quality unless you need selectable sidebands to eliminate interference. Two QSLs the past days: KCJJ Iowa City IA 1630 and CKDO Oshawa ON 1580, both by email. Well it didn't arrive on Monday. Or Tuesday. But Wednesday! It is s/n 3609, in other words part of the recall. So I pulled out my signal generator and AC voltmeter and started measuring. I was stunned. I had to go through the setup again and again to make sure that I hadn't done anything that could make the results incorrect. I used slow AGC, 400 Hz, 30% modulation depth and 7 kHz bandwidth in pure AM (not AMSD). From deep in the LW band right through MW the sensitivity was -112 to -115dBm, mostly around -114 so in fact better than 0.5uV! Could the signal generator results be dublicated in real life? Well almost. I tested the E1 and a 746Pro on the Australian 4KZ-1620 which was a threshold levels at the time. Audio recovery in the 0.6uV 746Pro was marginally better than the E1. But the margin was very narrow indeed. And that is as far as I have come today. Oh, one last thing. It has a sort of rubberized surface. I don't like that. It is bound to collect (and keep) dust. And I wonder how it will sustain to wear and tear. First impression: I like it. Not bad at all. Saturday evening and Sunday morning were the best DX so far this season, with X-and Australians at good levels, and a mix of East Coast NA, Caribbean and Venezuela. Sunday morning brought good strengths from the usual dominants but also stations like WZAM-ME 970, WEAV-NY 960, WZON-ME 620 and the new CKDO-ON 1580. Format changes from last season was noted for WLIB-NY 1190 (gospel, inspirational) and WMCS-WI 1290 ("Milwaukee's ESPN Radio"). Several Cubans noted, especially Rebelde 710 killing WOR's signal. Good signals from Radio Nacional de Venezuela 1310 and RCR 750. And two very interesting French-language stations, one on 640 (presumed Guadeloupe), the other on 930. Only one French there that I can think of, Cap Haitien. I have a recording of a couple of minutes that someone fluent in French must listen to. Sunday evening wasn't very exciting, and Monday morning even less so with signals fading out well before they should - nothing interesting either. Two QSLs found their way to my inbox during the weekend: On Friday I received an email from WMDD Fajardo PR 1480, and early Monday morning one from Radio Fiji Two, 1467 kHz. Email me if you want details. 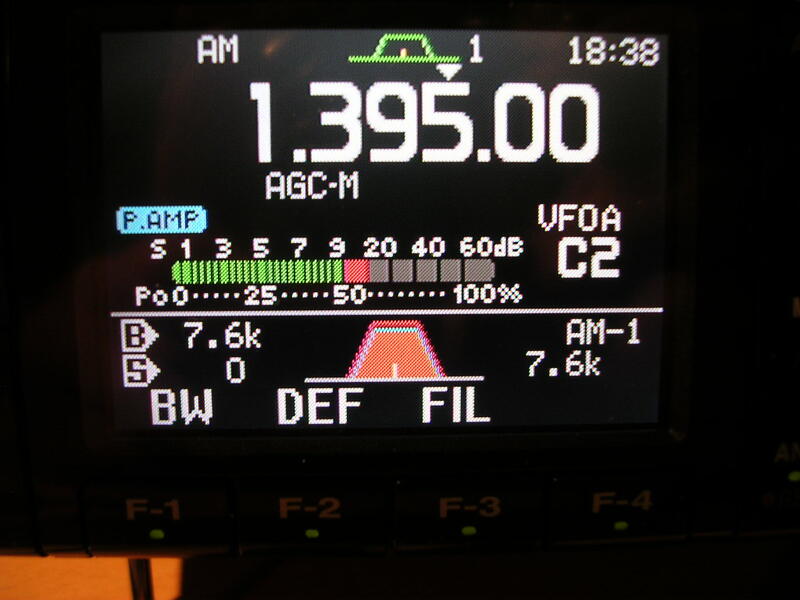 And the Icom IC-7000 has proven that it is indeed a very capable DX receiver. You simply can't go wrong with this one, if you're willing to pay the price (USD 1,500 or equivalent). The coming days will see if I could have saved myself $1000 by going for a different receiver - The Eton E1 is supposed to show up today, and of course I am going to set it up against the IC-7000! Conditions on MF were very good today, and the Australian x-band stations were heard with good signals. While on 1629 in USB mode I heard slow code, and decided to investigate this, since I knew that Papua New Guinea has NDB's in the 1.6 - 1.7 MHz range. OKT in Ok Tedi Mine, Western Province, 1632 kHz did in fact have a good signal. I also heard GA, Goroka in Eastern Highlands, 1725 kHz. Time: Around 1700 UTC. Later, at 1845 I also heard KUT Kutubu 1737 kHz. The initial responses from the expert beacon hunters suggest that Papuan NDB's haven't been heard in Europe before. Heard before or not - these are excellent catches and proof that when solar conditions are right (and they are), you can "hear forever". In a previous post I noted that the sensitivity of the IC-7000 starts getting worse in the middle of the MF band, growing increasingly more deaf with lower frequency, as bad as 25uV on 310 for instance. Measurements done with preamp on. Dallas Lankford informed me yesterday that this effect is due to the preamp. If the preamp is disengaged, and a Norton push-pull preamp is placed between the antenna and receiver instead, the IC-7000 will remain its excellent sensitivity at least down to 200 kHz. Indeed it is so. The receiver was very quiet when I tuned the LF band with the preamp on. When I switched it off, the signal level increased dramatically! I noticed this down to about 200 kHz, when the difference tended to decrease. Ingøy-153 was about equal level with and without preamp. I didn't bother to put up the signal generator for exact measurements. Maybe I will one day. Today's Word of Wisdom then: If you want to tune LF with the IC-7000, do NOT engage the preamp. Apparently, the previous layout was difficult to handle for MS Internet Explorer, so I have changed the template into one that seems to fit IE better. I use Firefox and Opera myself so I wasn't aware of this. 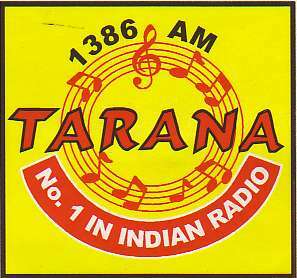 A most welcome letter from Hemant Parikh (Sales, Programming) at 1XOR Radio Tarana, Auckland, NZ, 1386 kHz today, together with stickers and a CD album. Heard in October 2005, it is the third NZ verified on MW for me. Thanks VERY MUCH to NZ DX-er Bryan Clark who visited the station explaining my business, and who even got 7 minutes live on the air telling Tarana's listeners about DX-ing and their distant audience. To start with, a picture of the display. I rather like it. Unfortunately the IC-7000 user manual is rather opaque on the properties of the MNF. It does not give any indication about the tuning range of the MNF, neither about the width of the Narrow, Medium and Wide notch filter settings. By trial and error, I found that the tuning range is +/- 5kHz. The filter width is pure guesswork. But the IC-746Pro's manual notch is 70 Hz wide, and that might fit with "Narrow". So maybe Medium is 200 Hz and Wide is 500 Hz? My guess is as good as anyones. Like I said there are two identical MNFs. You can choose one, the other, both or none (MNF Off). It can work together with the Auto Notch Filter as well. You can tune each filter independently within the (presumed) +/- 5kHz tuning range. In AM mode the effect is startling. If the filters are centered in the tuning range, they will notch out the frequency you're on, and the signal you are tuned to will simply go away. Well...sort of, anyway. Now, if you are tuned to 730 and 729 is giving you a hard time, you tune one of the MNF filters 1 kHz downwards until you hear the interference being nulled. I don't know yet which bandwidth setting is best - narrow, medium or wide, but they all seem to work. Wide is not a worse choice than the other two. If there are other noise sources in the passband, try to tune the other MNF filter to notch it out. ECSS mode is not as straightforward. As most will know, the USB and LSB bandwidths are asymmetric in shape, as opposed to the symmetrical AM bandwidths. So you need to tune the MNF not 1 kHz, but maybe 4 kHz, depending on the width of the SSB bandwidth chosen. Also, when using SSB mode to listen to AM signals, the AM detector and carrier are replaced with a product detector with the receiver BFO zero beat to the AM carrier. Maybe because of this I was not able to null the offending station the way I did in AM mode, but its signal level was nontheless significantly reduced. And the impact from splatter was reduced. Apart from bandwidth selections and passband tuning, the IC-7000 has a nice selection of tools to fight the noise and splatter that's left. There is often a lot of it, especially if you fancy MW stations from outside your own continent. The Noise Blanker is as far as I can see a traditional tool that should cope with ignition noise and similar pulse-type noise. It is adjustable. I haven't had the chance to test its capabilities yet. Reason: Absence of pulse-type noise. The Noise Reduction is adjustable as well, and a modest level of NR (2-4 out of 10) actually increases the S/N ratio of the station by a couple of dB. In some cases the difference between readable and not readable. The function works more or less the same way as in the 746Pro and is a useful tool. The Auto Notch Function deals effectively with hets, up to three tones at a time, and it tracks the tones when tuning (or if the tones move). The Manual Notch Function can be set to attenuate a frequency. Actually there are two manual notch filters, each can be tuned to the desired frequency and they can be individually set to Wide, Medium or Narrow filter width. There is no advice on how many Hz the selected filter width is. I will dwell a little with the MNF because I discovered that it is in fact a wonderful tool. I was listening to a noise-ridden Radio America, Paraguay on 1480 (LSB to avoid the DRM hiss on 1485, hence subject to splatter from 1476), when I more or less by chance turned on the MNF function. Splatter almost gone!! And I hadn't even tried to tune the MNF filters! Now, what was going on here... I tuned a 746Pro to 1480 and tried to engage its (single) MNF to reproduce the effect. No way... Apparently, the MNF, especially when set to "Wide" filter width, is capable of reducing the effects of splatter with a significant amount, resulting in a noticeable (I was about to use the word "dramatic" but I'll hold my breath) improvement in the signal's readability. I have a couple of recordings which I can email to anyone interested. DRM hiss was also reduced significantly, but I have yet to find out if it means that stations can be dug out of the noise. Effective use of the MNF may require some training. Audio quality will suffer from the tools listed above. Not much really, actually very little but if you put all of them into use simultaneously audio quality will degrade so much you would probably be better off in the first place. I tested the microphone as a remote/keyboard today. It contains most of the functions one needs, including frequency input, mode change, filter change, up and down tuning and memory functions. The keypad has a rubberised feel and need a distinct pressure to make contact. It should work fine as a remote keypad but the spiral cord is rather thick (as is usual with this kind of equipment) and as long as the transmitter is not disabled I'm a bit worried about accidentally pushing the PTT switch. I have the RF power set to 0% and the mic gain to 0% but still 2 watts will escape the IC-7000 during transmit and that will not do a lot of good to the antenna and distributing equipment connected to it. On the other hand, tx is only possible on the ham bands, so why worry... Also, keying a new frequency is somewhat awkward. First, press a button named "F-inp/Ent" (probably short for "Frequency Input/Enter"), then the frequency including trailing zeros (100's and 10's Hz), then press "F-inp/Ent" again. So, keying 1470 requires 8 key presses. Another possibility is John Hansen's Millenium QSY'er. I bought a kit for the IC-703, and although it is larger in footprint than the IC-7000 mic/remote, and has fewer functions, it works very well as a frequency input device. Keying 1470 is as simple as "1-4-7-0-*" where "*" is the Enter key. The buttons respond very quickly. It connects to the CI-V Remote Control Jack with a thin audio-type plain cord. The Millenium QSY'er is designed for HAM use and so defaults to a pre-determined mode designated for the frequency range you tune in to. AM mode on broadcast bands, USB on higher HAM bands etc. However, Mr. Hansen disabled this function for the keypad I ordered. My keypad does not change mode when I change frequency. The jury is still out on whether to keep the mic/remote as the default keypad for the IC-7000 or to buy another Millenium QSY'er.